Welcome on the Spanish food & recipes section. On this page you can find general information about popular Spanish food and some popular Spanish recipes. The Spanish Cuisine is one of the most varied and sophisticated in Europe and the rest of the world. Each province or even every little pueblo "village" has its own food speciality. Participate in our poll about Spanish Food? Share your opinion in our poll section and find out what other people think - it only takes 30 seconds! - What is your Favourite Spanish Dish? - Where in Spain do they make the best Food? Throughout Spain the food is influenced by the geographic situation and also by its long and interesting history. Many elements in the Spanish kitchen today have its origin from the Moorish occupation or even go back to the Roman occupation. The most famous dishes in Spain are La Pealla (the world famous rice dish), El Jamon Serrano (Spanish Ham), El Gazpacho (cold vegetal soup) or La Tortilla (Spanish Omelet) and the many different sausages. The Spanish wine and the famous Sherry are also an important element of the Spanish Food and Gastronomy. One thing that is common throughout Spain is the use of Olive Oil for cooking. The use of this oil has proven to be decreasing the possibility of heart diseases, improving the blood circulation & digestion and the oil is rich in vitamins. Another common eating all over Spain is seafood prepared in many different ways. Seafood is even common in the central part of the country were it is delivered fresh every morning. Tapas are also eaten all over Spain. A Tapa is a hot or cold snack which give you the opportunity to try nearly all the elements of the Spanish cuisine; meet, cheese, eggs, olives etc. Do you Like Spanish Food? In our new forum you can share your favourite recipes, ask questions about Spanish cooking or share your experience about Spanish food and restaurants! CLICK HERE to get participate. If you are interested in learning more about Spanish Food and wine take a look at the following websites. Culinary and Cooking Holidays and Wine Tours . 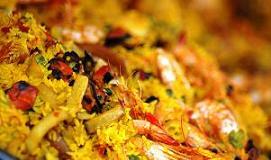 The most famous Spanish rice dish in the world is the Paella! Before you start cooking it is helpful to know that Paella is best made in a wide, shallow pan with looped handles; the Paellera. This recipe is to serve 4 but if you really love it 3 persons. Paella seems like an extravagant dish, well it is, but it’s easy to make. 1 red onion, 1 red and 1 green pepper, 4 cloves of garlic, 2 tablespoons of ( by preference fresh) flat-leaf parsley. You can either buy canned peeled tomatoes but by preference use to fresh ones. Peel of the skin and than rasp them with a grater. Peel and devein 16 large raw shrimps, cut 2 squid tubes into rings, and scrub and debeard 12 fresh mussels. Cover this all and put them into the refrigerator. Heat two tablespoons of olive oil in the paellera, cook a chopped red onion in it, add the 2 tablespoons of parsley and 3 of the 4 chopped garlic cloves. Cook this all for 8 minutes with an occasional stir. Now add the pureed tomatoes and 2 teaspoons of paprika and keep on cooking until the juice from the tomatoes has evaporated and the sauce is as consistent as a jam. Now put the Sofrito into a bowl and clean the paellera. Start cooking the mussels while the Sofrito is cooking. Put the mussels in a saucepan with a cup of simmering water, cover and steam it for 5 minutes. Remove the mussels discarding unopened and put them aside. Put 1 tablespoon of olive oil in the paellera and put it on a medium to high heat and add the last clove of chopped garlic. Place the shrimps in the paellera and cook them for 1,5 minute. Now add the squid rings and cook for another 1,5 minutes. Keep on tossing the paellera continuously. After this remove the shrimps and squid and flavour them with a little salt & black pepper. Now cover it all up and put it aside. Cook them in a medium heated paellera with two tablespoons of olive oil and stir occasionally for 6 minutes. Now add the sofrito to the pan and 1,5 cup of rice; this may be Calasparra, Bomba or regular grain rice is fine. Cook this for a minute with some stirring. Now add a pinch of saffron threads, 3 cups of heated fish or chicken stock, 1,5 teaspoon of salt and 1,5 teaspoon of black pepper, sir it a little to mix it up. Now let it cook for 10 minutes without stirring. Make sure all the rice is cooking; adjust the pan a bit when necessary. Now let it cook on a low heat level for 15 minutes. After this turn up the heat for a minute until you can smell the rice toasting. Remove the paellera from the stove and add the seafood, cover it all up and let it rest for 5 minutes. Now you’re ready to serve! Enjoy your meal – ¡Que aproveche! Final tip: serve it with lemons. 3 Spoons Olive Oil Vinegar, salt, pepper and water. Apart from the above ingredients you need a blender. To prepare a good Gazpacho is a simple and quick job. First Clean and part the vegetables. Then puree all ingredients in a blender for about 5-10 minutes. Strain, discarding any vegetable pieces that did not puree fully. The Gazpacho is best served cold. Drink a nice Spanish wine with your homemade Gazpacho to have the full Spanish experience! 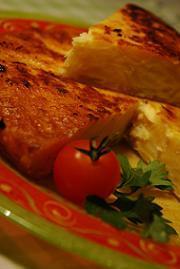 The tortilla can be served both hot and cold with fresh vegetables or in a sandwich.